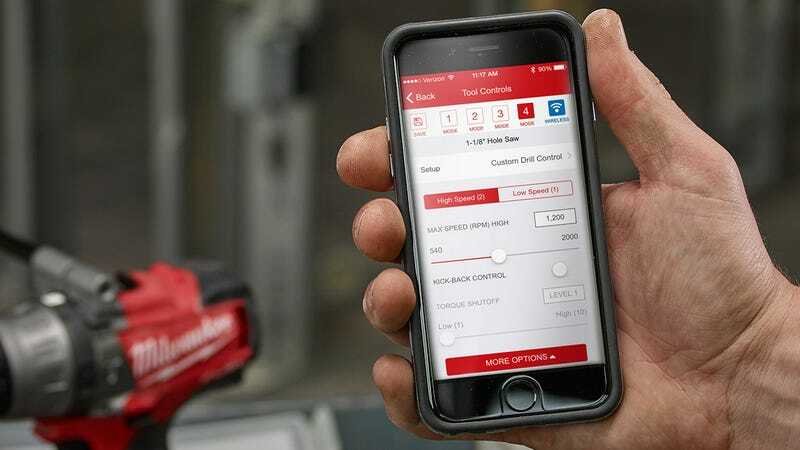 Milwaukee isn’t the first power tool maker to connect its hardware to a smartphone app for automatic inventory tracking. But the company’s One-Key app now goes a step further, allowing users to precisely tweak the torque and speed settings of their power tools for the specific task at hand. The company is introducing new drill drivers, hammer drills, and compact impact tools in its M18 line that wirelessly connect to the One-Key iOS or Android app. Sliders can be used to tweak many aspects of the tool’s performance, instead of having to rely on a handful of settings on a dial for torque, or the trigger for speed. When attaching a faceplate to a wall outlet, you probably don’t want your drill delivering as much power as you’d need for boring through concrete. And with the Milwaukee One-Key app, multiple users can create and quickly switch between countless presets customized for specific jobs or materials. Screwing into drywall definitely requires a lighter touch than screwing into a two-by-four, and with the One-Key app you can ensure that an accidental over-squeeze of the trigger doesn’t leave you with holes in a wall you then need to patch. The other advantage of being able to tweak and even limit a power tool’s speed and torque is improved battery life. Dialing back those settings means Milwaukee’s new M18 drills and fasteners, available starting in February, are going to run a lot longer before a fresh battery needs to be swapped in. And for home users who don’t have three or four batteries in reserve, it means they won’t have to annoyingly stop mid-project to recharge.